Today’s update is all about our aim to better show you all of the great things Dino Storm has to offer – and how you achieve greatness while playing. 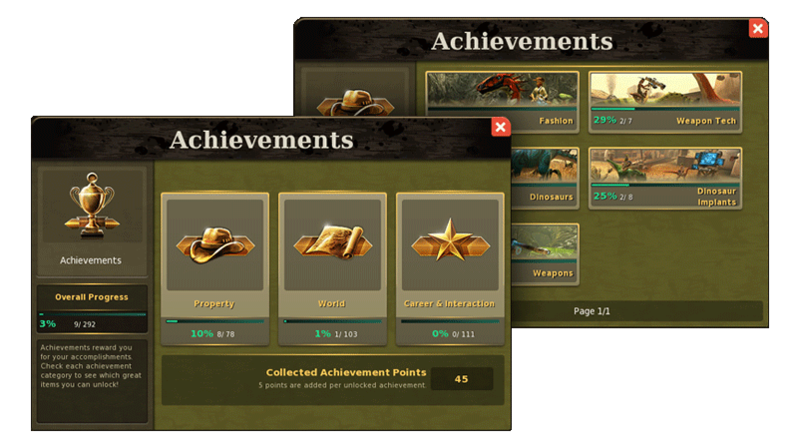 For many of you the hunt for achievements has already become a driving force in Dino Storm. Often enough however achievements only got noticed the moment they were completed by chance, and that is something we really wanted to change. Now you can see at a glance how achievements are bundled into categories, how achievements are linked to form chains, and which great rewards you unlock with each completed achievement! Achievements are already deeply rooted in Dino Storm, so we felt the tree of achievements itself could grow some new, stronger branches. This simply means that the game now has more things to achieve, more interesting challenges and – of course – more rewards for you! Don’t worry, everything you have already achieved in Dino Storm is still present in the new achievement tree. The names of individual achievements might have changed, but your accomplishments are worth even more now than before – be sure to check your new Achievement Points score!